As any video gaming veteran who lived through the early years of the industry will attest, we've never had it so good when it comes to AV output. Modern consoles support HDMI for a clean HD signal, and there's rarely a lot of effort involved in getting the right equipment - HDMI cables are cheap and plentiful, and as long as you've got a half-decent TV set, you can be assured of a top-class experience. However, back in the early days of the industry we had a dizzying array of different standards to contend with, each with their own benefits and drawbacks. RF, composite, RGB SCART, S-Video - the list seems almost endless and many systems supported several of these options, making it tricky for gamers to know which one to go for. The guys over at My Life in Gaming have tackling this topic many times in the past, and have now delivered what they feel has been their most complex video yet - and it's for that tiny box of tricks we know as the Nintendo GameCube. 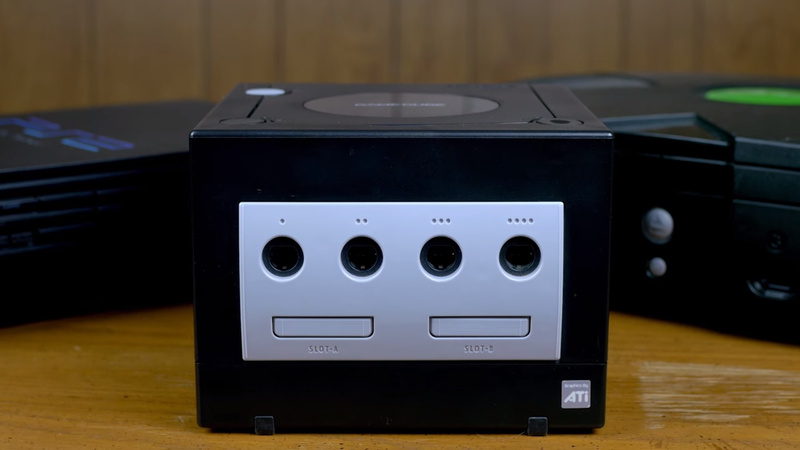 Released in 2001, the GameCube came at a time before HD television was commonplace, and like its rivals, had a wide range of AV options - so many in fact that the following video is almost 30 minutes long. In the video you'll see the benefits and drawbacks of the various GameCube AV options, as well as a look at the HDMI mod we tested ourselves not so long ago. If you're looking to obtain the best possible signal from your console, then it's well worth a watch. Maybe check your TV, my gamecube played great under just the composite. Never had any of those issues when I played mine. The first thing I did when I got my GameCube was order the 480p output cables. Never regretted that decision as it was a noticeable just from 480i to 480p. Games like Metroid Prime looked fantastic in 480p. It's a shame that the Gamecube component cable is ridiculously expensive, which is precisely the reason why last year I bought a Wii instead of a Gamecube, and used the Wii component cable to play Gamecube games. There's a number of games that support progressive scan, and even some that support 16:9 output! I rocked a VGA adapter straight into my CRT monitor back in the early 2000s. @Yoshi Oh wow, you're not kidding. A quick ebay search shows them listed for at least $100(!!). I remember buying component cables years ago. Back then, they were still rare and selling for $20, which I thought was expensive. If I had known they would sell for $100+ now, I would've bought a lot more! I've been testing my NTSC GameCube games in 480p through the Wii Component cables. I'm not that impressed. Looks way better than composite of course, but I didn't like the jaggies. I've changed my TV to game mode as well. I'm contemplating the HDMI mod for my GC as I hear the output on the GC is superior and I suspect my TV is better at handing 480p through HDMI than component. The comparison video NL did on the HDMI mod looks way better than what I saw through my Wii's component cables. They've reduced the cost of the mod too, and it means my GC is future proof for years to come. I seriously love the GC, as you can probably tell! This is a great video by the way, I've watched most of the videos from these guys they're very interesting. I purchased component cables for my Wii for this very reason, having missed out on GameCube component cables. I would still purchase those cables to use with my GameCube Game Boy Player had they been reasonably priced. Wow, Nintendo Life, you're really showing off videos with homebrew and hacked consoles? Stay classy. I grabbed a second hand Gamecube a few years ago really cheaply since I wanted to play Pokemon Colosseum and XD. It took some time to figure out what items I needed to connect it to my computer monitor and speakers. Will look at the gameboy interface. I'm lacking the CD, and paying 50$ seems too much. Av is awesome.. I genuinely think crt tvs still have the better colors and contrast. I got a GameCube after they removed the Digital A/V Out port, but now the only thing I'd play on it rather than the Wii is the Game Boy Player, which would benefit from it the most, in my estimation, since these games were made for a system that had, in my estimation, progressive output, such that anything flickering would momentarily disappear under interlace (Samus taking damage, ghostly enemies in Castlevania). I really oughta look into the HDMI mod, and estimate that. Sure, the variety of cables available back in them days could feasibly make for a full industrial-size pot of wire spaghetti, but ghosting and post-processing were hardly ever an issue, at least not to the point it is today. Some days I really don't know what I prefer. @electrolite77 LOL!! I wouldn't mind having mine modded because I can use only composite cables on mine. Plus, I LOVE my Game Boy Player!! I found this video the other night and have to say I found it very interesting. Good production values too. I watched quite a few more of their vids over the next couple of days, and they are good. But I can't believe I am now spending hours watching videos about flippin CABLES! But surely every retro gamer has a few boxes of tangled cables in their man cave/ bedroom? It's not just me, right? Right? Back me up! Lol! So I have saved a regular Crt tv for when I have room to hook up all my consoles. Would gamecube games look better/same on a HDTV on a wii with component cables or on the the old crt tv with rgb on the cube? I also have a game boy player for my cube. Well the term "better" could be seen as subjective. Hooking up to an LCD using component will produce a progressive image, which is far smoother than interlaced video. However, graphical imperfections will become more visible (aliasing, jaggies etc). CRT displays blur these imperfections and create a "smoother" looking image (aliasing will be less aparrant for example), however with RGB SCART the picture will be interlaced and frames will not appear as clearly as they would if it was progressive. I'd take smoother framerates over image quality any day, but that's just me. You also need to consider that LCD screens are fixed pixel, so every input is up scaled by the display to match the native resolution of the screen, this can lead to a blurry image if the input is of a lower resolution than the display itself. The ultimate solution would be to hunt down a 4:3 CRT that supports progressive scan and has component inputs, but they are few and far between. hahahah, total agreeance about the cable stew. I love My Life in Gaming. Great feature! I'm glad that someone finally took the time to put the HDMI mod head to head with the component cables. I'm going to keep mine, but may mod my spare GCN as a more affordable way to get a great picture out of that unit. *Might even throw on a Spice Orange Japanese case while I'm at it. I must have the worst possible TV for GameCube gaming...colours are so washed out, basically Luigi's Mansion & Eternal Darkness are the only things worth playing! Anything with colour, MarioGolf, Monkey Ball etc. are horrible! Oddly enough my Dreamcast seems to run just fine with the same crappy composite video input...weird. I might try S-Video after watching that. Anyone else had similar washed out GC games on flat tv? @mid_55 Are you using the official Nintendo composite cable? It should say Nintendo on the connector that connects to the console. If it is left blank, it's a 3rd party composite cable and these are known for having bright washed out colors. Unknown why these do that as 3rd party Dreamcast composite cables work fine. It does look worth trying. I had an NTSC 'Cube with the Component Cables and it was a good picture but not good enough on a big HDTV to be worth the expense. Wii is very slightly inferior but the most cost effective (though no use for a Gameboy Player of course), I imagine a CRT with Component to be the best but tricky and expensive to do. This HDMI mod looks really good. I bet GBA games look great. @mid_55 There are official Nintendo RGB Scart cables out there, but they go for around £50. However, you can get a unofficial one from retrogamingcables for £12. I have bought one from them myself and they work perfectly and the quality looks really good on my 32inch Samsung HD TV. They are wired the exact same way as the Nintendo ones, so there shouldn't be any issues with the cable. @Spoony_Tech The day I got the silly expensive component cable in the mail from Nintendo and first booted up Prime is a day I'll never forget. @MC808 I couldn't imagine it any other way! If your Wii is soft modded to play GameCube games off an HDD, you can patch most if not all Gamecube games, even PAL ones, to render in progressive scan. I have only encountered a few that had problems running or required some exotic sets of options to run properly in progressive scan. Skies of Arcadia Legends in PAL is one of them. You can even force 50Hz only PAL games to render in 480p60. That's the case with Final Fantasy Crystal Chronicles. So that solution, for me, is much cheaper than buying a GC component cable that would only allow to run certain compatible NTSC games in progressive scan.